DEA Blames Emo Rap For Opioid Epidemic? It all began, apparently, with the arrest of a Soundcloud rapper that even Spin magazine refers to as "obscure" Michael Jones (no relation to rapper Mike Jones) better known as New Jerzey Devil where he's known it all. Jones was arrested October 3rd for distributing a fatal supply of heroin and fentanyl to Diana Haikova. It was upon the little known internet rapper's incarceration that the DEA decided they might be able to find a suitable scapegoat for the opioid epidemic by simply blaming emo rap music. For those who, like myself, were unaware, emo rap is evidently a thing that actually exists… or at least that's what Vibe magazine and other outlets reported after the DEA's press release. The DEA's Special Agent in Charge, James J. Hunt made the following statement: “This investigation led us into the underbelly of emo rap and its glorification of opioid use.” Coming from an agency that deals with cartels, gang members and other unsavory elements on a fairly regular basis using the phrase "dark underbelly" should mean something. 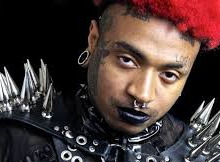 Speaking of gangs, Jones was connected in the initial report to an emo rap collective with the garish monicker of GothBoiClique. The group themselves and their label, however, have challenged this claim. Regardless of whether Jones was guilty associating himself with a group that would be conflating rap and/or emo culture with Gothic music, he was definitely charged with the crime of selling fatal doses of opioids. According to the police, Jones was in Long Island for Lil Peep's funeral in December of 2017. This conflicts with the claims of the dead rapper's family. It begins to appear as if, perhaps because of the heat laid on the case by the DEA report, no one even wants to admit having known or met with Jones. Regardless, the initial report from the police had Jones meeting the now deceased Haikova at a hotel party during which time he offered her the drugs that led to her overdosing in her apartment days later. Even if the story of the meeting at the funeral is purely apocryphal it is ironic to note that Lil Peep was found dead at 21 in his tour bus after an apparently, accidental overdose of Xanax and fentanyl. <a href="https://www.spin.com/2018/10/justice-department-emo-rap-opioid-epidemic/">Spin pins the connection between emo rap and opioid overdoses</a> on TMZ coverage that connected Jones to both Peep and the GothBoiClique. As Spin pointed out, SAC Hunt never explains how tens of thousands are dying opioid-related deaths when only a small portion of them listen to emo rap. In fact, in between the confusion from TMZ regarding Lil Peep and the GothBoyClique and Spin's article claiming the DEA's comment about emo rap being "tied" to the opioid overdose (the press release itself says no such thing apart from the mention of "glorification" of drug use) being spun into headlines declaring DEA "blames" emo rap for the opioid epidemic, this story has proven bewildering to a number of music reporters. Gottlieb himself has previously claimed that the Southeast Asian plant kratom, a relative of coffee, could fuel the opioid epidemic despite lack of any evidence of such. Kratom is no more addictive than coffee and, unlike caffeine, has no overdose deaths directly connected to it. I've always considered the fact that perhaps Gottlieb is projecting a bit. Many analysts have pointed to the increased access of the incredibly potent drug fentanyl in increasing the severity of the current opioid crisis. Gottlieb himself had a hand in that increased access. Dr. Gottlieb was an expert witness working on behalf of Cephalon, the manufacturers of fentanyl. In 2006, Cephalon was under investigation for illegally marketing the fentanyl outside of its accepted use in those with severe, chronic pain related to cancer. Gottlieb argued that Cephalon should be able to produce more fentanyl than the amount they were currently limited to. Cephalon was facing charges that it had illegally promoted the drug fentanyl and paid a $425 million fine in 2008. Gottlieb lobbied on behalf of the fentanyl makers once again. And that's our FDA Commissioner, Scott Gottlieb, friend of fentanyl. But yeah, I guess we can blame emo rap too. Lil Peep? Do they call him "Bo?" Pretty sure they call him "deceased." MDMA, a very safe drug which has now been "discovered" by mainstream medicine to safely treat PTSD.. and now we have an "opioid epedemic". oooooh…. sounds scary. well, it wasn't a problem UNTIL our lovely DEA started attacking doctors for prescribing this drug so they stopped and that led to the ILLEGAL manufacture of a very potent synthetic opioid which is dangers because it's ILLEGAL and therefore the potency unknown causing overdose. so you see that the problem is greatly exacerbated BY THE FEDERAL GOVERNMENT so that they can continue to pick taxpayer pockets and bash down doors.